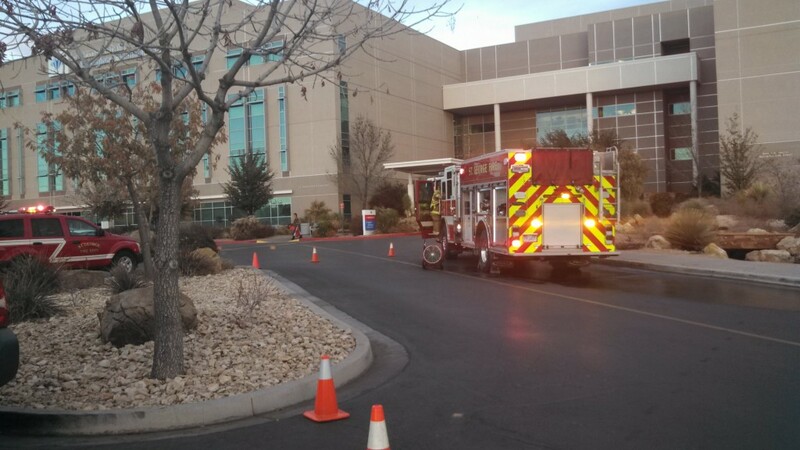 ST. GEORGE – A fire reported at Dixie Regional Medical Center Saturday afternoon prompted a swift and hefty firefighter response in an incident that proved to be more a temporary inconvenience than major event. 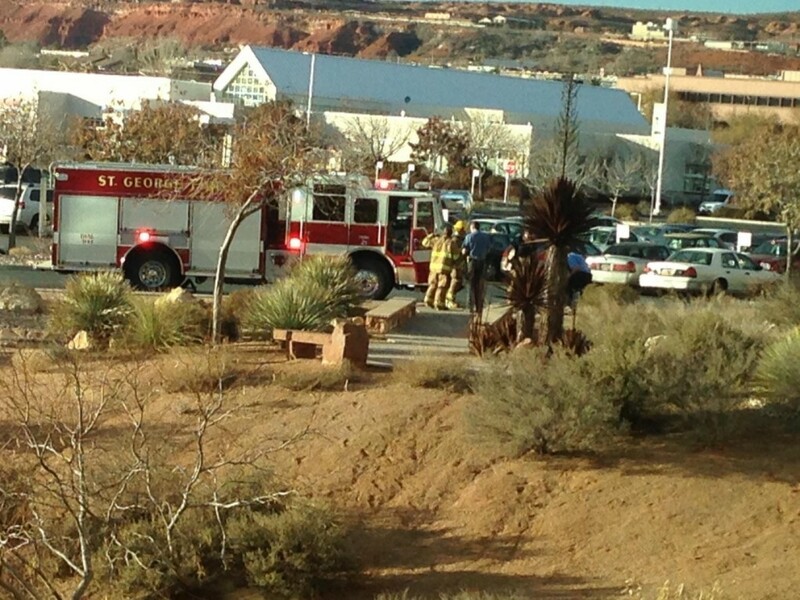 Four fire trucks packed with firefighters from the St. George Fire Department rushed to the hospital after receiving a call, around 4 p.m., that a room in one of the patient towers on the third floor had somehow caught fire. 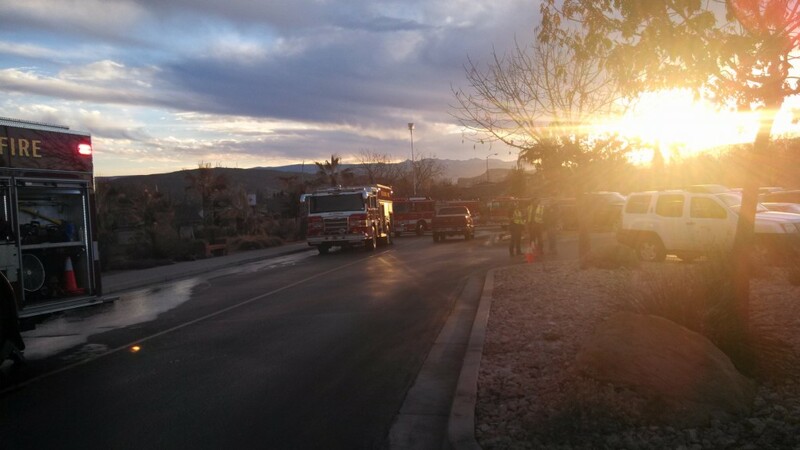 The fire was contained to one room and was quickly put out, St. George Fire Capt. Rick Nelson said. The fire, which was somehow started by a rechargeable battery, he said, produced more smoke than flames. Most of the fire had already been put out by an extinguisher by the time the firefighters made it to the room, he said. After making sure the fire was completely out, the firefighters started setting up fans and equipment to clear the lingering smoke from the the third floor. Renon Hartley was visiting her father in the hospital on the third floor when the fire alarm went off. She and others in the room were told to stay put for the moment, though began to notice smoke coming in from the bathroom. She said it looked like the smoke was going room-to-room through the bathroom ventilation. In order to keep the smoke at bay while they waited in the room, a towel was wedged into the space between the door and the floor. Hartley and other visitors in that part of the third floor were soon evacuated from the area and told to wait down in the hospital’s lobby until the situation improved. 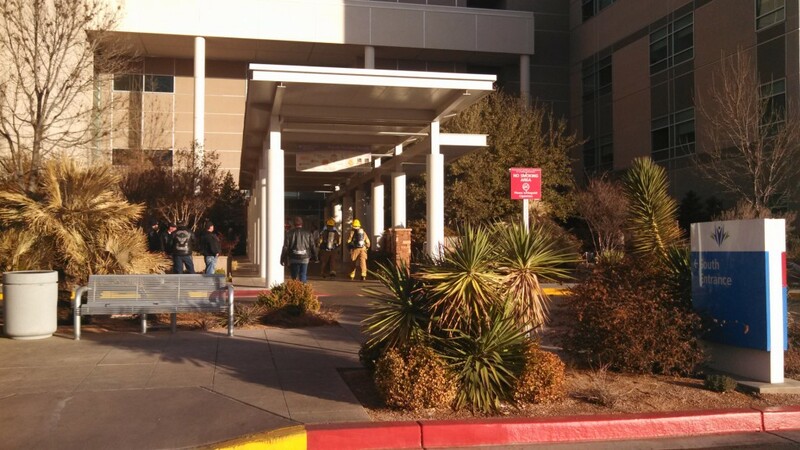 Hospital personnel were also busy evacuating patients to other parts of the hospital while the firefighters worked on clearing the smoke. Hartley praised DRMC’s staff during the incident for how well they handled the incident. “The hospital staff was very professional,” she said. The hospital’s various lobbies filled with people waiting for permission to visit their friends and loved ones inside. They were finally able to do so by 5 p.m. A portion of the third floor remained closed at 5:30 p.m. as the smoke continued to linger. The closure of the area did not appear to affect overall hospital operations. Nelson said the Hospital was designed to keep operating even if an entire section was shutdown. “It’s a great design,” he said. 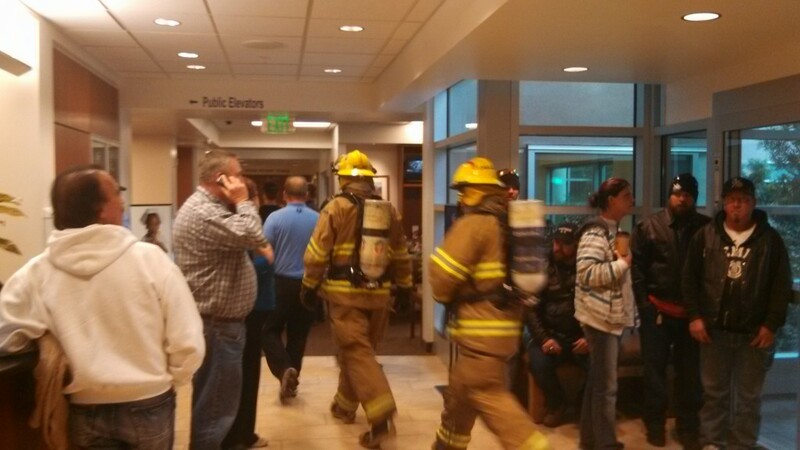 “We’re grateful it was a small incident and no one was harmed and that the staff acted efficiently,” said Terri Draper, communications director for Intermountain Healthcare’s Southwest Region. 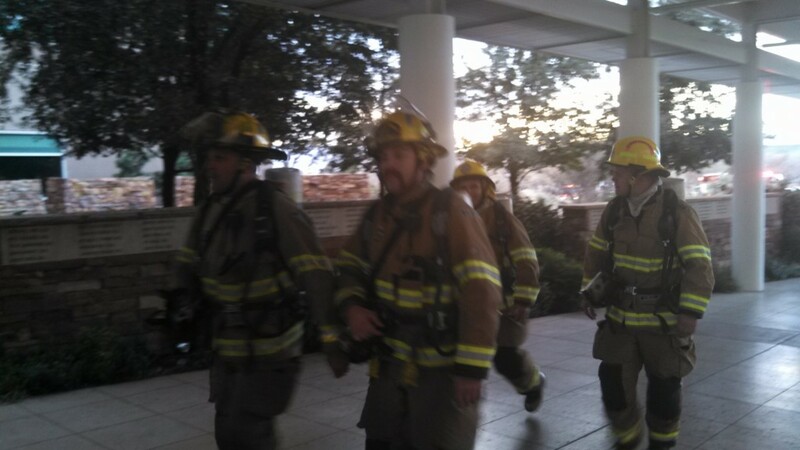 DRMC’s staff hold regular fire drills, Draper said. No injuries were reported in connection with the fire. Damage for the patient’s room was also reported to be minimal. 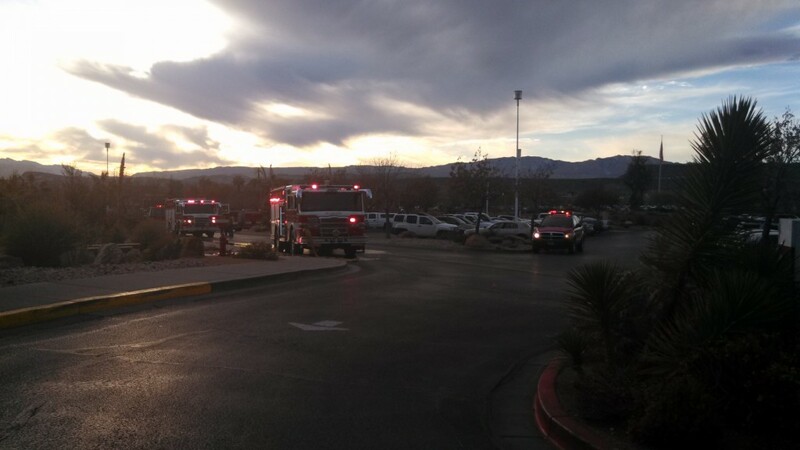 Smoke was cleared from the third floor around 6 p.m.